Seems a good price for a 20-watter with modelling functions. 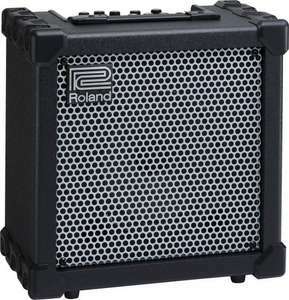 The Roland Cube 20XL is compact and feature packed. Small yet mighty, the 20XL is an affordable yet powerful member of the XL family. The CUBE-20XL delivers 20 watts of output through a high-performance 8" custom speaker. The compact size is perfect for practice at home and band rehearsals, and is conveniently portable. I haven't checked whether GG charge delivery on these. Modelling amps taking over the world! Hot deal. The 40w and 80w ones are also heavily discounted. Ouch! I've just seen the 80XL here for a ton less than I paid. These are great sounding, robust amps that look great too and at these prices it's a no brainer hot deal. This model (Cube 20XL) has been replaced by the (much better sounding and fuller-featured) Cube 20GX. This is obviously old stock being sold off cheap. If they even have any (as the GX has been out a fair while now...). This one might be good at modelling, but it's no pin-up. Only took me two days to come up with that. I'll get me coat.